Before the March Break, Ms. Lazer's and Mr. Clark's classes studied Willy Wonka and the Chocolate Factory in order to prepare them for when they entered our class "chocolate contest". Both classes had to decide on the ingredients of the chocolates they would create, decide the number of chocolates in their box, create an array for the chocolate to go inside the box, design an original lid and write a persuasive letter to the judges of the contest in hope that their chocolate idea will be selected. 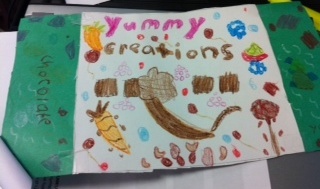 This cross-curricular unit incorporated math, language and art. These grade 2/3 children are really excited to see if they will be the big winners of the chocolate contest! 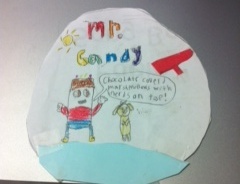 Below are examples of several lids and an example of one student's persuasive writing (we're glad that she still found something healthy about chocolate!) Would you vote for her chocolate? I am excited to enter your Chocolate contest! 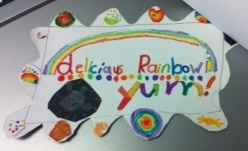 I know that you're gonna love my Delicious Rainbow chocolates and will pick them as a winner! Firstly, I have eaten a lot of chocolate and I don’t think they have enough colour so I added sprinkles to my Kisses! Next, I heard that a lot of people in my neighbour like caramel so I put caramel in all of my chocolate so I’m sure you’re gonna like them! Finally, I was reading a book at the Markham library and one of the sentences said that dark chocolate is healthier than white chocolate and all of my chocolates are dark which makes my chocolates healthy! You should pick my chocolate because it is healthy. Have you seen a chocolate with sprinkles before?